Since both FunkyPlaid and I are participating in Project 365, sometimes we spot our daily photo at the exact same time. It has caused some consternation, so I decided to document it in a meta-commentary of sorts. 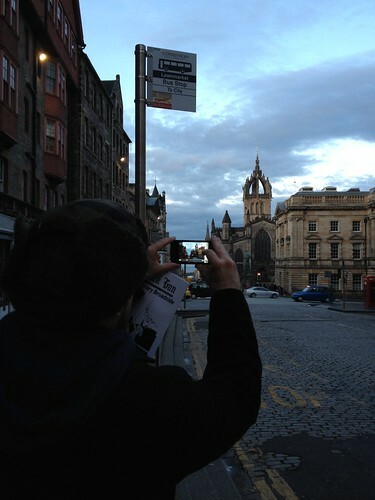 This is the view of the Royal Mile and St Giles’ on our way home from the pub. If FunkyPlaid ever uploads his photo (*cough*) you can see his view. There are many benefits to participating in this project, but the one I ponder most often is how my view of the city will start to change as I become acclimated. After a while, I assume I will take fewer shots of capital-L Landmarks and more of little inconsistencies and foibles. Although I am deeply smitten with the place, I still see most parts of it with a tourist’s eye.